I have followed this series since Hunter's debut and was excited to pick up this, the third in the series. When I got my hands on it, I quickly dove in knowing I'd enjoy the story. So here's a small blurb, and we'll chat on the other side. Already starting their marriage on shaky ground, can Adelaide and Trent's relationship survive the pressures of London society? The book opens at Adelaide and Trent's wedding. I have to say, that caught me off guard. I felt as though I was missing something and for once, wished for a prologue. Quite honestly, I'd have loved to see a few of the moments that led to their being forced to wed. We definitely see snippets of it throughout the book as they recall the incident, but I would have loved to see it on page. Tossing that aside, the start of the book sets our protagonists up for quite a bit of conflict. It was an interesting concept that definitely snagged the story-teller and reader in me, and I happily dove into this tale. And overall, I really enjoyed it. I do believe Hunter could have added more interactions between the two and found a bit of a faster pace at times, but when Adelaide and Trent were together, their relationship was one I rooted for. They definitely had many obstacles to overcome. I found Trent's desire to court his wife adorable and romantic. I could relate to Adelaide's insecurities and had an intense dislike of her mother. Hunter nails these characters, their desires, and their fears, making them very believable. And while I still love the first book of this series the most, it was wonderful to finally see Trent receive his happily ever after with such a deserving woman. His tender treatment and protection of her made him the hero we already believed he could be. 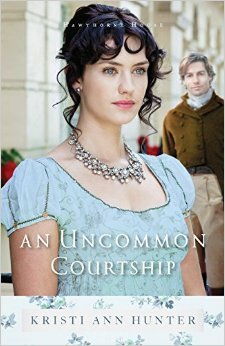 Overall I give An Uncommon Courtship 4 out of 5 stars and you can purchase it here. Please note that while this is book number three in the series, they can all be read as stand alones.